This is the big piece I've been working on for weeks!!! 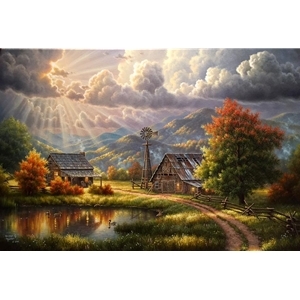 This is a painting inspired by life on the farms here in the mountains of Cades Cove, Tennessee! I always love capturing light and feeling in my paintings. A good painting can transport you in time or make you feel like you're in the scene. In this piece, heaven's light is breaking through the clouds of a September cold front. You can feel the fresh cool air blowing in over the mountains. The trees are just faintly tinged with autumns warm tones and some mallard ducks have arrived from Canada to spend winter on a southern farm. The wind mill stands strong and faces the winds of change, as sun casts its light on this homestead that reminds us of a simpler, more beautiful time gone by. This painting is an 18x27 and is titled God Shed His Grace.